The chances the Southeastern Conference getting two teams in the College Football Playoff took a hit Saturday. Or maybe it would be better described as a chomp. 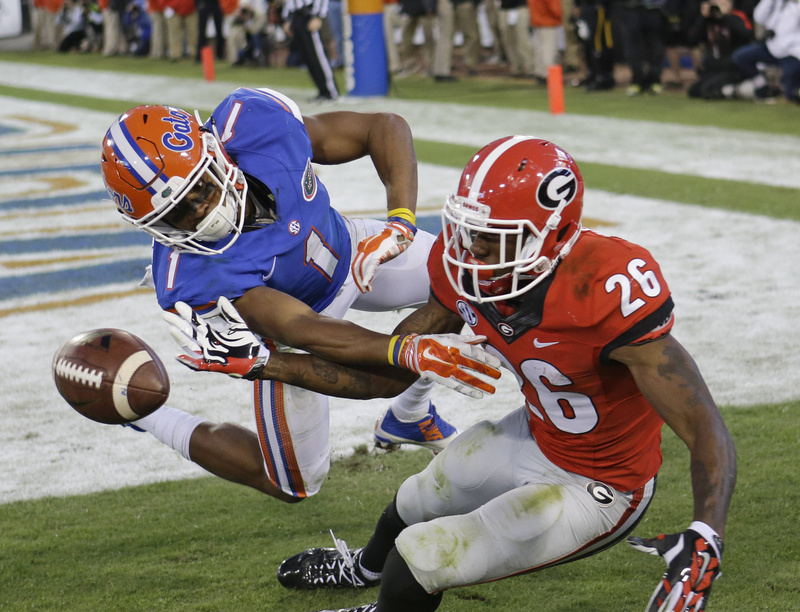 Florida’s emphatic upset of No. 9 Georgia took a chunk out of the resume of what looked like the SEC East’s best team. The Bulldogs (6-2, 4-2, No. 11 CFP) seemed to have a fairly manageable path to the conference championship game, along with the opportunity for a big victory against Auburn on Nov. 15 when star tailback Todd Gurley returns from suspension. Now, with two losses to a pair of teams (South Carolina and Florida) that have been inconsistent at best this season, Georgia’s looking like a long shot. The Bulldogs will need help just to get to the SEC championship game. And if the Bulldogs were to go on a run and win the conference, how would the committee handle that? Leave out the SEC West winner and take the Bulldogs? Take one of those SEC West powers over the conference champion? It’s all about the West in the SEC now as far as the playoff is concerned. The best the teams in the East can do is not get in the way. The Big 12 avoided a similarly problematic upset Saturday when No. 10 TCU, which was the highest ranked team in the playoff top 25 at seventh, beat West Virginia on a last-second field goal. The Horned Frogs return home to play Kansas State next week and a game that will go a long way toward determining the Big 12 champ. After that, TCU has a relatively smooth path with at Kansas, at Texas and Iowa State to close the season. Five conferences vying for one spot and $4 million. You can’t call them BCS busters anymore, but in many ways it’s the same concept. The so-called group of five – the American Athletic Conference, Mountain West, Conference USA, Mid-American Conference and Sun Belt – won’t be putting a team into the College Football Playoff, but it gets about $75 million in revenue to share and is guaranteed one spot in the other New Year’s bowls. East Carolina was in the driver’s seat to earn that spot – and the additional $4 million that goes with it – for the American as the only team from outside the Big Five conference in the first playoff rankings. A sloppy visit to rainy Philadelphia could cost the Pirates dearly. Temple pulled a stunner of an upset, beating the Pirates 20-10. East Carolina (6-2, 3-1, No. 23 CFP) outgained the Owls by nearly 300 yards but lost five fumbles. The Pirates already had wins against North Carolina and Virginia Tech of the Atlantic Coast conference, plus a competitive loss at South Carolina. The beneficiary of ECU’s misstep could be Marshall. The 23rd-ranked Thundering Herd (8-0) weren’t in the playoff rankings and are off this weekend.